This tasty recipe is perfect for weakfish, porgy, triggerfish, sea bass or even cocktail bluefish fillets. Photo by Tom Schlichter. 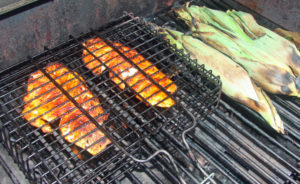 Here’s a simple and quick recipe for grilling fish that are one-off from pure white flesh. Think weakfish, porgies, triggerfish, sea bass or school blues weighing less than three pounds and you’ll be in line for some delicious eating. Salmon is another great choice, especially if you’ve been lucky enough to get to Alaska and shipped some fillets back home. The following recipe is designed to have a significant bite. Lighten up on the spices, however, and it will do just fine with less oily favorites such as fluke or winter flounder. Pair this recipe with a fine Long Island Long Island chardonnay such as Lenz Gold Label or Pindar’s Sundial, and serve up a helping of North Fork Potato chips to add some crunch. Enjoy. 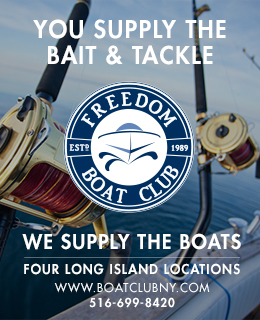 1.5 – 2 lbs fillet of porgy, weakfish, triggerfish, sea bass, school blue or salmon. Check that fillets are free of bones and are chilled but not frozen. In a small bowl or cup, mix together Old Bay seasoning and cayenne pepper. Pat fillets dry on both sides and cover both sides with seasoning. Place in refrigerator for at least 30 minutes. Remove fish from refrigerator and brush both sides with olive oil to prevent fish from sticking to grill. Place fish in wire fish rack and grill on medium heat for 8 to 15 minutes, depending on thickness of fillets. Turn only once. Remove fillets from grill and ladle each with one teaspoon of butter (optional). Drizzle each fillet with juice of one lemon or lime, then sprinkle on chopped parsley (optional). Serve with lemon or lime wedges and a fresh garden salad of mixed greens, tomatoes and sliced peppers. Pair with a Long Island chardonnay such as Lenz Gold Label or Pindar’s Sundial, plus a generous helping of North Fork Potato Chips or fresh, roasted local corn.